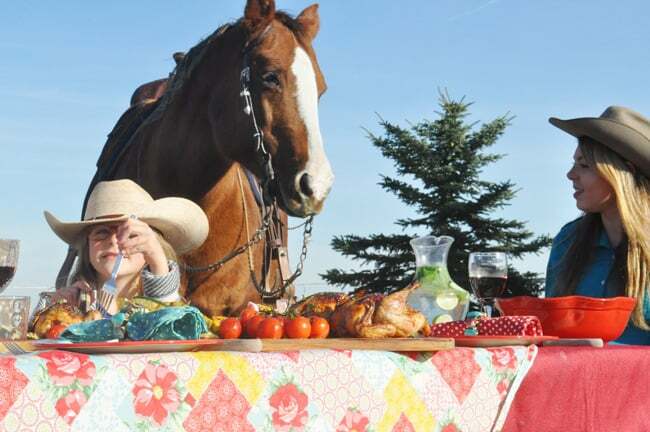 The weather has been unseasonably nice for winter in Canada recently so we decided to prep the Western Horse Review kitchen and get ready for the upcoming Christmas season, while hosting an outdoor dinner party for our friends. This year we have been lucky to have the opportunity to learn a few things from chef, Mike Edgar. 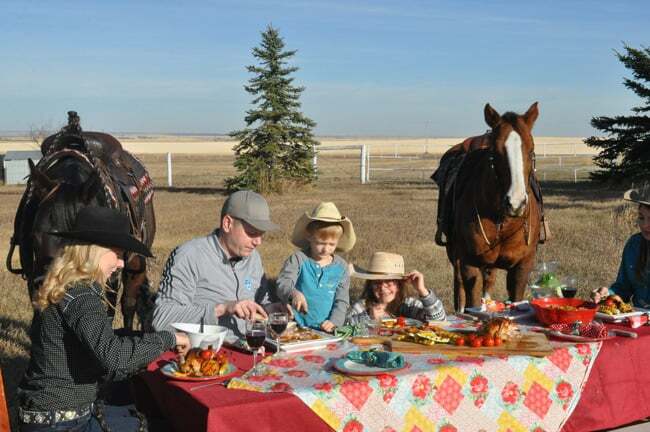 And on a day with no wind, we literally invited our guests up from riding to sit and enjoy a meal. 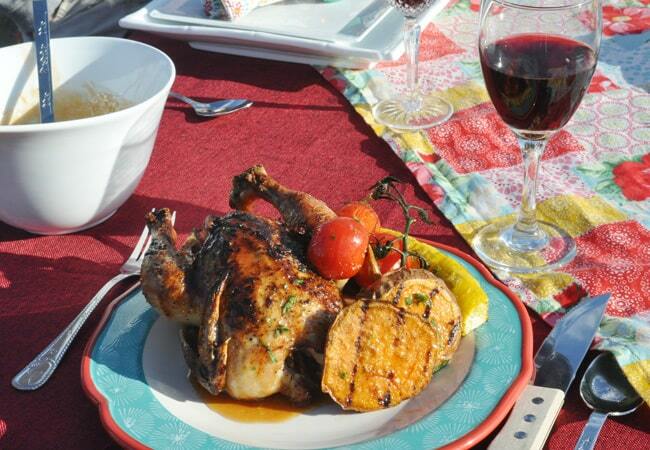 Here, Chef Edgar shows us how to prepare a delicious dinner of roasted game hens with sundried fruit stuffing, brandy cider glaze and grilled vegetables. Be forewarned – this may become you’re new favorite Christmas tradition! METHOD: Preheat oven to 450 degrees Fahrenheit. Stuff each hen with rosemary, 1 clove of garlic, and 2 slices of lemon. Season the skin with salt and pepper. 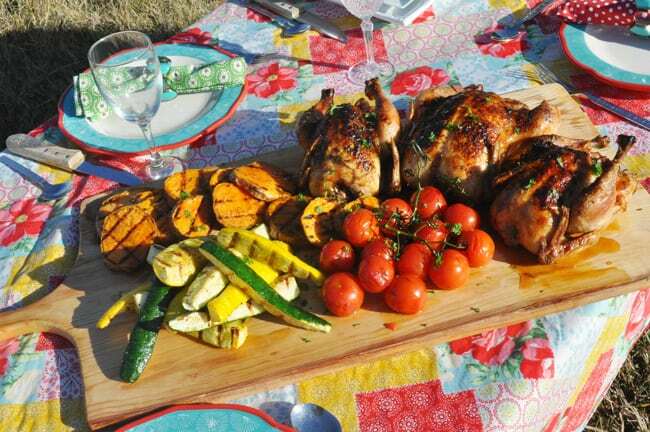 Put hens in roasting pan, place on the middle rack and reduce the heat to 350 degrees. Cook for an hour and 20 minutes. Baste the birds every 15 minutes with apple cider. METHOD: Put all ingredients in a sauce pan and reduce on medium heat until it reaches a syrup like consistency and strain. METHOD: Toss all vegetables with olive oil, salt and pepper, grill until tender. METHOD: In a large frying pan sauté carrot, onion, celery, garlic, thyme, salt and pepper until the vegetables are tender, add the sundried fruit, continue cooking for 2 minutes, deglaze the pan with the wine, brandy and cream. Allow the mixture to reduce by half. 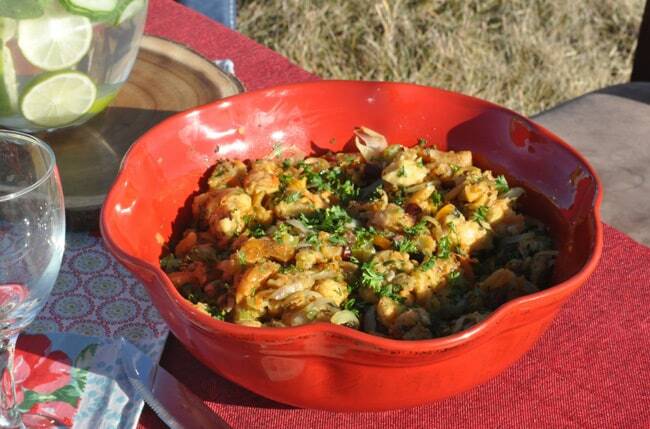 In a large bowl mix the cubed bread and the hot vegetable, fruit mixture together, when cooled add the chopped parsley. Transfer to a oven safe dish. Bake at 400 degrees Fahrenheit. For 10 minutes. 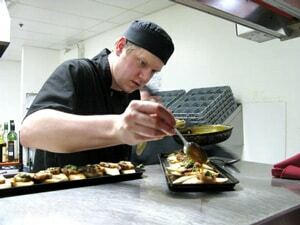 Mike Edgar graduated from the Southern Alberta Institute of Technology in the Culinary Arts. He stayed in Calgary, AB working at some of the city’s top restaurants. In 2007, he opened his own restaurant in Calgary’s east end. After eight years of being a chef there, Edgar decided to take a step back and left the industry to spend more time with his son. His son has now expressed an interest in learning his father’s skills and in horses simultaneously.